One such event in 2008 cost $10 billion in damages for the entire state of Iowa. After the flood, the Iowa Flood Center (IFC) at the University of Iowa (UI) was established as the first center in the United States for advanced flood-related research and education. Today, simplified 2-D flood models are the state of the art for predicting flood wave propagation, or how floods spread across land. 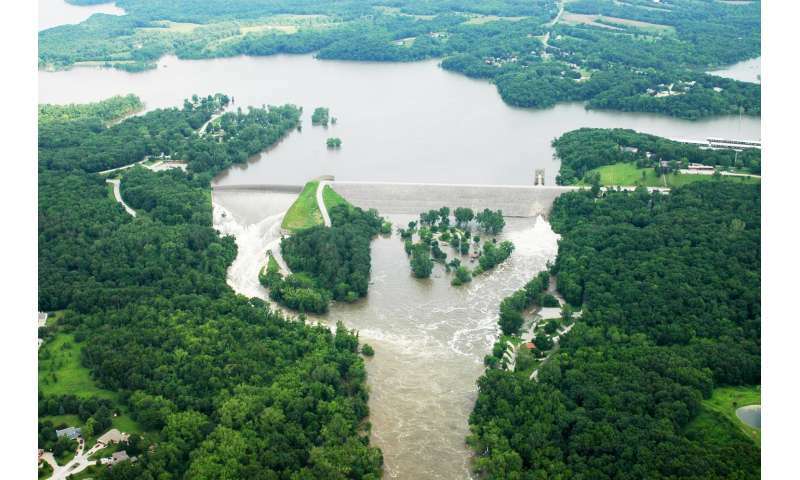 A team at IFC, led by UI Professor George Constantinescu, is creating 3-D non-hydrostatic flood models that can more accurately simulate flood wave propagation and account for the interaction between the flood wave and large obstacles such as dams or floodplain walls. These 3-D models also can be used to assess and improve the predictive capabilities of the 2-D models that government agencies and consulting companies use for predicting how floods will spread and the associated risks and hazards. Using one of the world's most powerful supercomputers—Titan, the 27-petaflop Cray XK7 at the Oak Ridge Leadership Computing Facility (OLCF)—Constantinescu's team performed one of the first highly resolved, 3-D, volume-of-fluid Reynolds-averaged Navier-Stokes (RANS) simulations of a dam break in a natural environment. 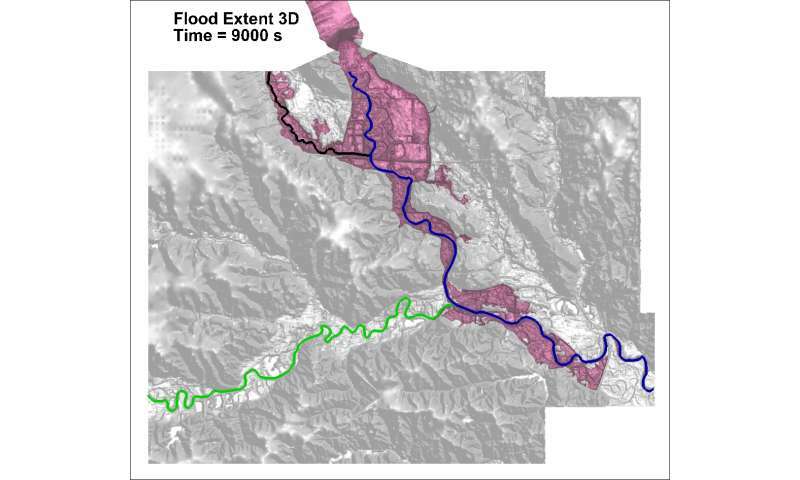 The simulation allowed the team to map precise water levels for actual flood events over time. RANS is a widely used method for modeling turbulent flows. "Flood events, like those generated by dam breaks, can be computationally very expensive to simulate," Constantinescu said. "Previously, there wasn't enough computer power to do these kinds of time-accurate simulations in large computational domains, but with the power of high-performance computing [HPC] and Titan, we are achieving more than was previously thought possible." The project was supported in 2015 and 2016 within the OLCF's Director's Discretionary user program. The OLCF, a US Department of Energy (DOE) Office of Science User Facility located at DOE's Oak Ridge National Laboratory, provides HPC resources for research and development projects to advance scientific discovery. 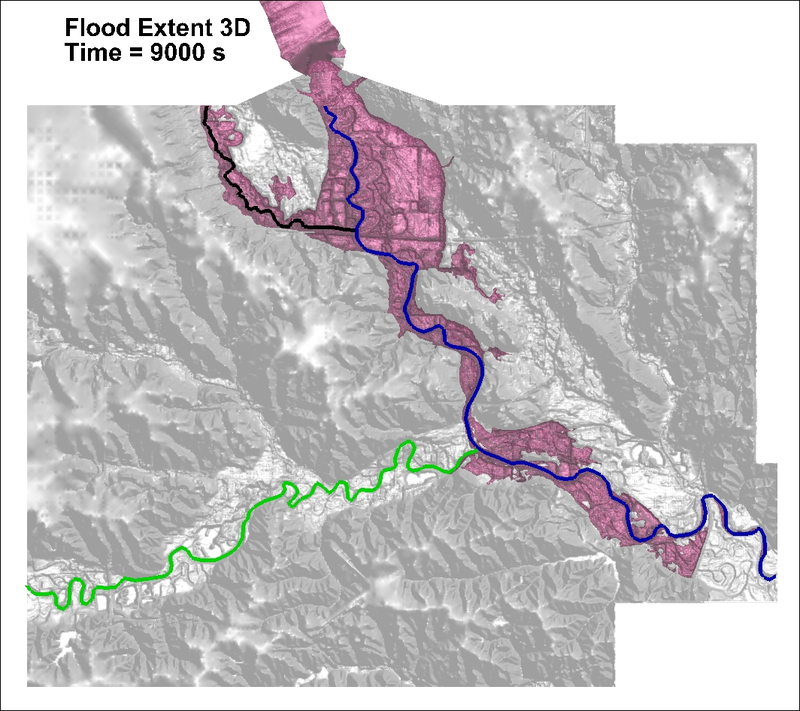 The team's 3-D simulations showed that commonly used 2-D models may inaccurately predict some aspects of flooding, such as the time over which dangerous flood levels last at certain locations and the amount of surface area flooded. Simulation results also demonstrated that 2-D models may underestimate the speed at which floods spread and overestimate the time at which flood waves reach their highest point. When the water sources that empty into a river rise simultaneously, they can trigger one or more successive flood waves. Accuracy of the 1-D, 2-D, or 3-D flood models that track how these waves move is crucial for predicting maximum flood depth, hazardous conditions, and other variables. "We need to know what's going to happen for situations in which a dam breaks," Constantinescu said. "We need to know who's going to be affected, how much time they will have to evacuate, and what else might happen to the environment as a result." Because 2-D models make simplified assumptions about some aspects of the flow, they can't account for changes in the flow, such as when the flood wave moves around large obstacles, changes rapidly in direction, or fully immerses bridge decks. The team needed a leadership-class supercomputer to run the 3-D simulations and accurately capture these changes. 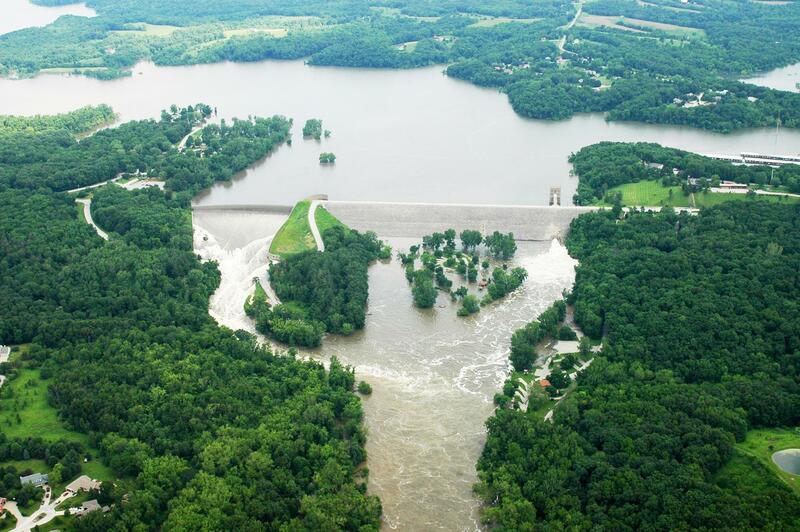 Using a fully non-hydrostatic 3-D RANS solver, the team performed the first simulations of the hypothetical failure of two Iowa dams: the Coralville Dam in Iowa City and the Saylorville Dam in Des Moines. Each used a computational grid of about 30-50 million cells and covered a physical area of about 20 miles by 5 miles. The team used the state-of-the-art computational fluid dynamics software STAR-CCM+. This software features a volume-of-fluid method to track the position of the water's free surface—the areas where water meets the air. In a scalability study, the team determined the peak performance of the code for the dam break simulations. The researchers used 2,500 of Titan's CPU processors for peak performance in each simulation. "By performing these 3-D simulations, we provided a huge data set that can be used to improve the accuracy of existing 2-D and 1-D flood models," Constantinescu said. "We can also examine the effectiveness of deploying flood protection structures for different flooding scenarios." The team ultimately showed that HPC can be used successfully to answer engineering questions related to the consequences of structural failure of dams and related hazards. Constantinescu said that as computers become faster and more powerful, simulations of full flooding events over larger physical regions will be possible. Summit, the OLCF's next-generation supercomputer that is scheduled to come online in 2018, will unearth new possibilities for Constantinescu's research. "Advances in numerical algorithms, automatic grid generation, and increased supercomputer power will eventually make the simulations of flood waves over large durations of time possible using Titan, and even more so with Summit," Constantinescu said. "Eventually, things we previously had to do by hand, such as generating a high-quality computational grid, will just be part of the typical software package."